"It was an interesting demonstration, however I did have reservations about his techniques especially since he seemed to put so much emphasis on doing the whole procedure in less than 30 minutes. I sure wouldn't want to climb on the student the next day! I much preferred John Lyons and know I would be able to climb on his student the next day with little to fear." "That's how I feel, too. What ever happened to not rushing the horse? What good does chasing a horse around a round pen do? How does something like that demo affect its mind in the long term?" When I perform this technique in public on rare occasions I stress that saddling and riding an untrained horse in 30 minutes is NOT the point. The point is to demonstrate how quickly you can develop a cooperative horse with an abnormally high trust and acceptance level. The saddling and riding is but a demonstration of that trust and acceptance. 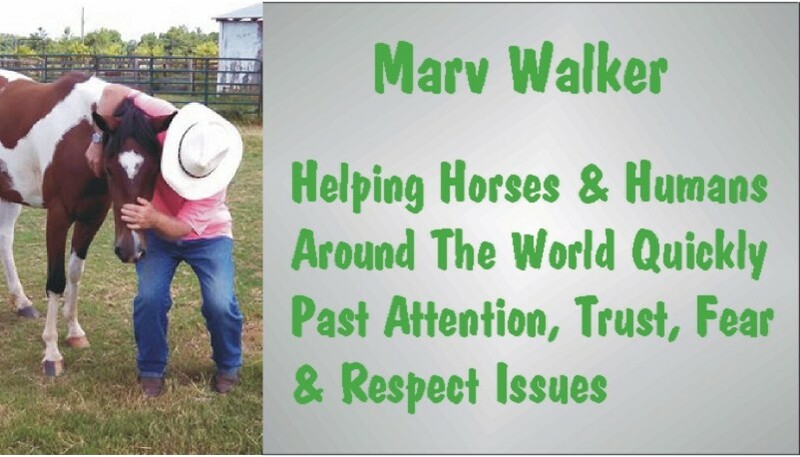 I know very little about the clinician discussed other than who he is, but I do know that he has no illusions he produces a saddle horse in 30 minutes. No true horse reader thinks anyone can produce a saddle horse in a half hour or less. If he tells you otherwise, he simply doesn't know what he is talking about. While you *CAN* have a previously unhandled and unsaddled horse under saddle and carrying a rider in 30 minutes it is BY NO MEANS BROKE. "Breaking" a horse requires a careful well thought out systematic approach with considerable ground work before getting into the saddle. "Breaking" a horse CAN take years to accomplish depending on your situation, ability, and goals. It can't be compared to getting approved for a title Max title loan in 30 minutes or less! Because putting a horse under saddle for the first time in minutes is unusual and spectacular, a clinician may do it as a demonstration of the horse's compliant state of mind. However, the clinician usually has a lot of experience reading horses and instinctive skills in implementing his methods. Anyone who promotes this practice in courting disaster. We must be careful not to throw out the baby with the wash water here. I hear people discounting things simply because these things do not agree with how they perceive things to be. "What good does chasing a horse around a round pen do?" Very little. However, moving a horse around a round pen, or similar enclosure, for a few minutes in a calculated intuitive scenario will cause psychological changes in a horse and produce a much deeper level of understanding and cooperation between human and horse. "What ever happened to not rushing the horse?" I think nothing happened to it. At least, my motto and aim anyway is to not rush the horse. From what I've seen of the horse readers who I feel have the touch, I believe for the most part, it is also their motto and aim as well. We all know, rushing accomplishes nothing. How do I reconcile what I just said to 30 minute saddling, or 30 minute despooking, or 30 minute loading or any of the other rapid changes we effect in a horse? And 30 minutes is a long time to work on some of the things we do. Is THAT rushing the horse? If the horse isn't ready for it, you betcha, Red Ryder. It sure is. I, and any of the others will be the first to tell you that. If the horse is ready for it, it isn't rushing. If the horse is ready for it, and you don't do it, what condition does THAT set up? Boredom? Inattention? Impatience? The secret is to progress at the pace the horse is ready for. How do we judge the speed? We communicate with the horse. We immediately establish dialogue and set up a two way connection with the horse. Everything we do says something to the horse. Everything the horse does says something to us. The horse tells the reader, whisperer, communicator or whatever term you use, the moment it is ready for the next step. There is no doubt, no confusion, no delay, no wasted time. "I sure wouldn't want to climb on the student the next day!" Well, I'd rather climb on him the next day than the first. The next day, he will be even more compliant. The third, even more so. Will he be a full blown reiner, cutter or roper, what have you? Nope. Not at all. But he will be so much closer toward being one than the horse that is dawdled and dabbled with. Will he be a better, more capable horse? Don't know. I only know he will be a more focused, more willing, less troublesome horse to train. "How does something like that demo affect it's mind in the long term?" Because the demo is rooted in many millennia of highly refined herd dynamics it gives the horse a sense of place and order and reaffirms its instincts as an equine. A large percentage of horse problems come from trying to instill human qualities i.e. love, pleasure, satisfaction, the ability to chose between right and wrong, in the horse. Something like that demo not only settles and calms the horse's mind, it settles and calms the human's mind as well. It bonds them together in one mentally connected unit. I have a bonding scenario that is part of my Mind Meeting Mind In Minutes techniques that many people from around the world have tried and gotten good results from. When properly performed it will work on any horse not mentally ill or aggressively rank. It works on a lot of rank horses too but that is an area best left to highly experienced horse handlers. If you do not have a copy click here to email for a copy. Performed in the manner I have laid it out, it is guaranteed to dramatically improve your horse's attitude. It is NOT, repeat, NOT, repeat, NOT intended to be used to "Break A Horse In Under 30 Minutes"